The issue of death penalty has been debated, discussed, studied from a prolonged time but till now no conclusion can be drawn about the retention or abolishment of the provision. 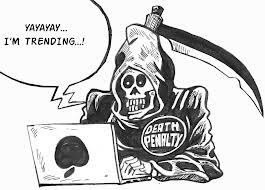 Death penalty has been a mode of punishment from time immemorial which is practiced for the elimination of criminals and is used as the punishment for the heinous crimes. In many countries the death penalty is dropped and is replaced by life imprisonment. Various countries have different outlook towards crime in different ways. In Arab countries they choose the retributive punishment of “an eye for an eye” others have deterrent punishment. Of late there has been a shift towards restorative and reformist approaches to punishment, including in India. India is one of the 78 retentionist countries which have retained death penalty on the ground that it will be awarded only in the ‘rarest of rare cases’ and for ‘special reasons’. Though what constitutes a ‘rarest of rare case’ or ‘special reasons’ has not been answered either by the legislature or by the Supreme Court. The constitutional validity of the death penalty was challenged from time to time in numerous cases starting from Jagmohan Singh v. State of U.P where the SC rejected the argument that the death penalty is the violation of the “right to life” which is guaranteed under article 19 of the Indian constitution. In another case Rajendra Prasad v. State of UP, Justice Krishna Iyer has empathetically stressed that death penalty is violative of articles 14, 19 and 21. But a year later in the landmark case of Bachan Singh v. State of Punjab, by a majority of 4 to 1 (Bhagwati J.dissenting) the Supreme Court overruled its earlier decision in Rajendra Prasad. It expressed the view that death penalty, as an alternative punishment for murder is not unreasonable and hence not violative of articles 14, 19 and 21 of the Constitution of India, because the “public order” contemplated by clauses (2) to (4) of Article 19 is different from “law and order” and also enunciated the principle of awarding death penalty only in the ‘rarest of rare cases’. The Supreme Court in Machhi Singh v State of Punjab laid down the broad outlines of the circumstances when death sentence should be imposed. Similarly in various other cases the Supreme Court has given its views on death penalty and on its constitutional validity. But the punishment of death penalty is still used in India, some time back the death penalty was given to Mohammad Ajmal Kasab. The Pakistani gunman convicted in 2008 Mumbai attacks was sentenced to death by hanging and after a long discussion, politics and debate was finally hanged on 21 November 2012. Next in the row is Afzal Guru, convicted in 2001 Parliamentary attacks was also hanged after a huge political discussion on 9 February 2013.The next convict in the death row is Devendra Pal Singh Bhullar, convict of 1993 car bombing will be hanged in the coming days as his mercy petition was rejected by the Supreme Court by holding that in terror crime cases pleas of delay in execution of death sentence cannot be a mitigating factor. Jagmohan Singh v. State of U.P (1973) 1 SCC 20. Rajendra Prasad v. State of UP, AIR 1979 SC 917. Bachan Singh v. State of Punjab,(1979) 3 SCC 727. Machhi Singh v. State of Punjab ,AIR 1983 SC 957.